August 25, 2017 – Expedition 52 crew mates on board the International Space Station (ISS) helped raise awareness for pediatric cancer on Wednesday, August 23, with the on-orbit debut of a hand-painted spacesuit inspired by the cooperation between the five international space agencies that built the station. The six crew members took turns answering questions written by children who had contributed to the suit. Former NASA astronaut Nicole Stott, who launched the Space Suit Art Project to raise awareness of issues surrounding childhood cancer and to demonstrate the benefits of art in the healing process, spoke from Mission Control Center in Houston. During the 20-minute Earth-to-space call, Colorado astronaut Jack Fischer, whose daughter Bethany is a cancer survivor, wore the ‘Unity’ spacesuit and said that it was the coolest thing he had seen in space. He also thanked everyone for supporting the program. It all started as a collaboration between MD Anderson’s Arts in Medicine Program, NASA’s Johnson Space Center and the space suit company ILC Dover. The first two space suits, Hope and Courage, were completed before the initiative expanded worldwide. After a 14-day global art tour in 2016, Stott and the Space Suit Art Program were happy to expand the initiative to involve hospitals in ISS partner countries so as many children as possible could add their own personal touch. 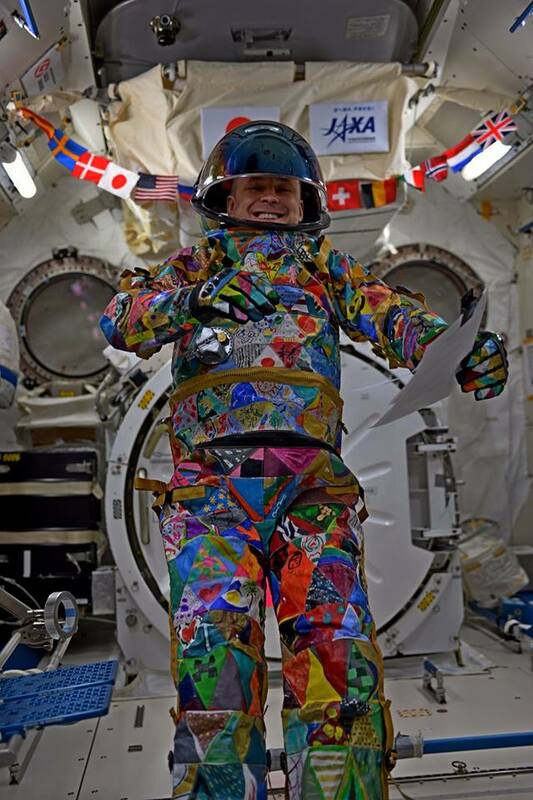 Hundreds of cloth pieces were hand-painted by patients in the United States, Canada, Germany, Russia and Japan and then quilted together by ILS Dover, the same company that creates all of the soft goods for NASA’s spacesuits. In addition to bringing awareness to pediatric cancer, the Space Suit Art Project also highlights work being done on the ISS to find treatments and cures for various diseases here on Earth. The space program has conducted hundreds of experiments to learn more about what makes cancer tick, to create better pharmaceuticals, and to improve delivery of those drugs. Some investigations have already entered clinical trials on the ground, while others are part of follow-up experiments on the orbiting laboratory. Astronaut Peggy Whitson highlighted one of the current experiments during the call on Wednesday. On the ground, a fourth suit called ‘Exploration’ has already been started. “We’re really hoping that this project will help us facilitate more art in medicine programs around the world and pediatric cancer research on the space station,” said Stott.